Our veterinary ultrasound machine allows us to offer you the best possible care for your pet in a non-invasive, non-painful way by using sound wave technology to visualize your pet’s internal organs and structures. Global connections through our veterinary telemedicine program can give us even more detailed answers in hours instead of days when information about your pet is critical. 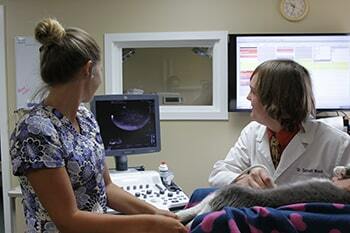 Diagnosing diseases and abnormalities in your pet is much easier with the use of our veterinary ultrasound machine. Compared to traditional x-rays, sound waves from the ultrasound can penetrate your pet’s internal organs and give your veterinarian a clearer picture of what’s going on inside. The veterinary ultrasound provides a non-invasive and non-painful way of looking for nodules, masses, cysts, abscesses, pregnancies, and even heart disease. Using real time echocardiography allows us to see the heart in motion. From these images, measurements can be made of cardiac function. The veterinary ultrasound is one of the most effective ways to determine the source of symptoms and how to treat them in a wide variety of cases. Our staff is trained and continues to learn new techniques to make this technology useful and effective in diagnosing and treating your pet. Our involvement in a worldwide network of ultrasound specialists further enhances our ability to address your pet’s needs.